I have decided to add a new section to my blog that talks solely about the history of aviation. I have grown to really enjoy and appreciate the history of airplanes over the last several years and this seemed like the most logical way to consistently bring what knowledge I have learned to others to enjoy. Every Thursday I will be writing some form of review of a different aircraft highlighting everything that I can think of from development, to service, and to todays usage. With that in mind, it took me a while to decide which plane to start with. I have had the great fortune to have photographed so many great aircraft, that many have become favorites of mine. As some of you might recognize this plane, I decided to start with one of the first planes that I photographed and was in fact the first aircraft I ever did an air to air shoot with. This is the North American AT-6 Texan. 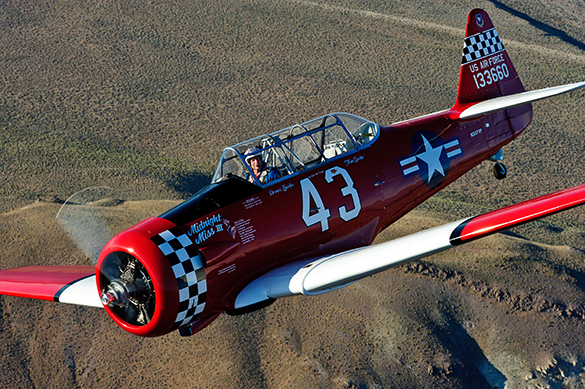 This is the AT-6 Texan, redesignated the T-6 in 1962, one of the most used and collected warbirds that exist today. The T-6 was designed as an advanced trainer aircraft during WWII and was used at some point by almost every serviceman that went through the US Air Corp. After completing basic training on the biplane Boeing Stearman, pilots would go on to advance training where they would learn to fly mono wing planes such as the Vultee BT-13 Variant and AT-6 Texan. Afterward depending on the proven skill set and placement they would go onto either single engine training school or multi engine training, basically separating the class into fighter pilots or bomber pilots. The AT-6 played a pivotal role in training pilots being one of the first training aircraft they flew with metal surfaces, hydraulic flaps, retractable landing gear and .30mm machine guns mounted in the wings for aerial and ground gunnery practice. 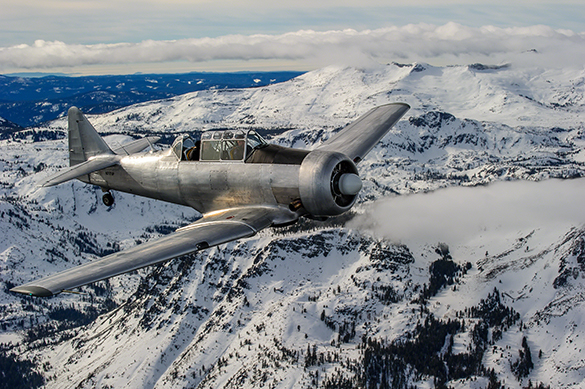 The T-6 was such a popular aircraft that 34 countries signed contracts with North American for planes of their own. 15,495 T-6’s were built to supply the orders from the other countries as well as the US. Throughout it’s service the aircraft has been known under several designations: the USAAC and later the USAAF designated it the AT-6 until 1962, US Navy designated it the SNJ and the British Commonwealth air forces designated it the Harvard, which is its best known name outside the us. Due to the T-6’s ease of maintenace, low cost and large production, it has become one of the most popular warbirds collected today. Unlike fighters or bombers which had a relatively short lived life expecantcy overseas, the T-6 lasted long past WWII and was used during Korea as a trainer for the US. It never saw front line service as a fighter for the USAAF but it was used by other countries up through the 1970’s as a fighter plane. With its Pratt & Whitney R-1340-AN-1 Wasp radial engine, 600 hp (450 kW), the plane was capable of speeds up to 208 mph. This later changed as the planes performance was enhanced for racing. The T6 gave pilots the ability to do rolls, Immelmanns, loops, spins, snaps and vertical rolls which was partly why it made for such a good trainer. This later allowed the plane to be very versatile in aerobatic roles at Airshows. 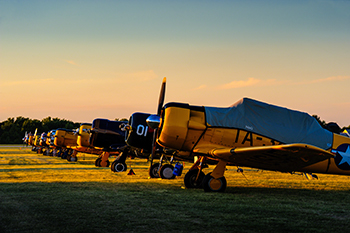 Seen here is a row of T-6 trainers at EAA Airventure Oshkosh from 2011. Because they have such a low cost to fly they have become such a staple in airshows that it is actually hard to find an airshow that doesn’t have at least one T-6 around. Amongst the most famous group of Airshow performers is the famed CAF Tora! Tora! Tora! group which uses several replica Zero and Nakajima “Kate” Torpedeo bombers which are all modified T-6 Texans. One of the great historical aspects of the T-6 is all the different paint jobs that the plane had from going to so many different countries and being used for so many different squadrons. This particular plane is based out of Honolulu and is owned by a nice man named Bruce Mays. His T-6 is painted in honor of the USS Saratoga. These are the aircraft markings of a plane that would be stationed on that carrier. Back in 2011 I had the great privilege of lying with Bruce and my Dad on an air to air mission with his T-6 over Pearl Harbor. Being such an iconic spot in WWII history, and with such few warbirds actually on the island, this was by far one of the most fun and satisfying air to air shoots that I have ever been on. The only slight challenge to the whole matter was having to fly in a Cessna 172 in the back seat shooting through the plexiglass windows. Nevertheless the images and story were all worth it. 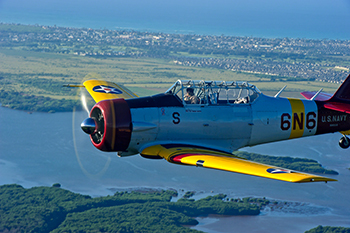 Not to mention his T-6 looked absolutely gorgeous in the morning light over Oahu. While the T-6 makes a great photo subject, and in my opinion is one of the best warbirds to practice air to air photography with, it is also one of the best photo platforms to use. With a good range in speed, again low cost in fuel consumption, and high rate of availability, the T-6 is one of the most sought after photo platforms, especially those with the reversible rear seat allowing the photographer to shoot straight back. In 1920 Ralph Pulitzer sponsored the Pulitzer Trophy Race to establish publicity for his newspaper and aviation. The races later moved to Cleveland where they become known as the Cleveland National Air Races, which lasted until 1949. The races were put on hold during WWII but resumed afterward. They initiated a special class after WWII just for the T-6 Texan. That class continued on to the Reno National Championship Air Races, which started in 1964 after the Cleveland races were shut down. 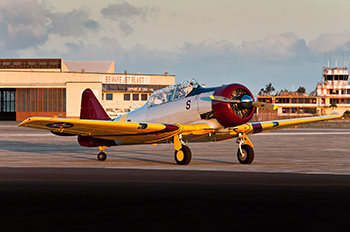 Today the T-6 class at Reno is one of the largest classes of competitors, including fan favorites like #6 “Six Cat” owned by Nick Macy with six gold medal wins to his name and #43 “Midnight Miss III” owned by Dennis Buehn with five gold medal wins. This here is Dennis flying his beloved Midnight Miss III back in 2013 at Pylon Race School. Dennis was the start of air to air photography for both myself and my Dad and has been a friend of ours ever since. He showed us that not only are the planes really cool but the pilots are a breed of their own. One of the most important lessons they teach is not about history, but that life can be over in a blink of an eye so enjoy every minute of it. Dennis continues to race his team of aircraft, further influencing those in the warbird community. He has owned and rebuilt over seventy T-6’s in his life which makes him one of the true experts on the aircraft. 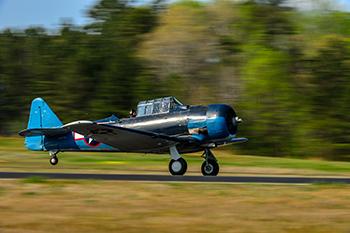 The T-6 Texan, SNJ or Harvard if you prefer, is one of the main stay aircraft of the warbird community. If ever there was one cornerstone aircraft that all pilots have at one point or another, flown, it was this one. If it were not for this plane many of the brave men who fought in WWII may not have gotten as good of training as they got. Today these planes can be seen all around the world, and is one of the few planes that that can be said about. At museums all across the country visitors can go and see the T-6 and at a price can even go and buy a ride in one. I highly recommend that anyone interested in aviation go and see about a ride. It will get you hooked.